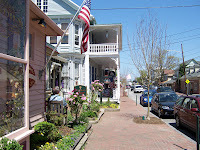 Mary and I decided to take advantage of the weather and spend the afternoon shopping in St. Michael's. 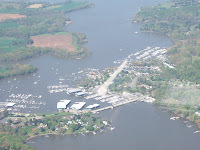 The plan for departure was 8:15ish with maybe a stop for breakfast then a short hop to KESN, Easton, MD. My brother and his wife were on the pax list but I guess after looking at the low clouds they decided not to fly. No problem, Mary and I made a stop on the way to the airport for breakfast and triggered the gate to the ramp by 9:30. We had decided to let some of the cloud cover clear. After pre-flight we saddled up a taxied to runway 27. We had to hold for a Mig 21 that was doing T&G's and now decided on a full stop. The ride was bumpy today, not the rocking and rolling type but up down plus or minus a couple of hundred feet type. Easton was busy this morning as we called in 15 to the north for a full stop on runway 33. I positioned myself for a four mile 45* for the right downwind for 33 and made my calls. I was number two behind something, can't remember, and added my flaps and held a nice center line. Not a bad landing this morning with another aircraft announcing base to final as I cleaned up and made my way for the taxi way. Landing on 33 is a bit of a taxi to the terminal but we enjoyed the stroll. We quickly found a tie down as I turned through an open tie down spot and came around to my left and shut down there. Mary gave me an atta boy as we only needed to push back straight for a few feet. We called to get a price for a cab and the wait was 45 minutes and $24 each way! We decided to rent a car instead for $49 and get under way right then and there. The young lady working the counter was excellent. She hooked us up with a nice car made all the calls for us and had a good sense of humor. 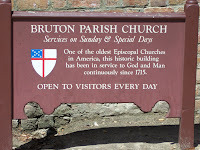 We were off in our rented Dodge Stratus taking in the sights and making mental notes of where the heck we were going. After making the rounds we headed to the Chesapeake Cove for lunch. Thank God the oyster shucking guy wasn't around, I'm not sure I could have handled that nasty slurping again. Mary and I each had the shrimp salad, I ordered potato salad and Mary the cole slaw, we shared for the taste test. The ice tea was cold and I was mighty thirsty, Mary had a glass of white wine. The Shrimp salad was pretty good but the cole slaw and potato salad did not make the grade. We decided to take advantage of the rental car and be bop around town taking in the sights and scouting new places to visit on our next trip. 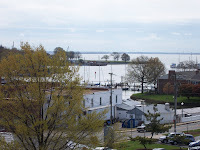 We found a restaurant just past St. Michael's, it's called the Chesapeake Landing. The place looked crowded so I'll take that as a good sign. On the way back through town we decided to try and find the local winery. 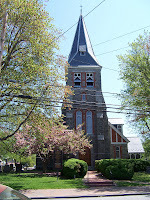 The St. Michael's winery is on south Talbut street, 600 block, but it's only a tasting location and a place to purchase. 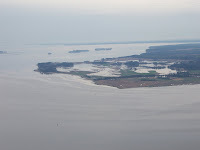 The vineyard is located on Maryland's eastern shore. With the winery shop sort of located we decided to call it a day and head back to the airport. We followed the main road out of town, traveling along Rt. 33 and I only missed one turn going back. We ended up in down town Easton. I doubled back to Rt 322, banged a right and followed that to Rt.50 from there a left and short haul to the airport. We can see 679er from the main road. 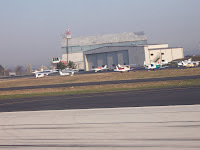 The airport was crowded with aircraft from teams that had flown in for a fishing tournament. We tied down on the front row along the terminal. Pre-flight completed we taxied out to runway 33 for departure. 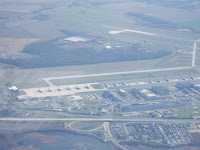 As we were completing our run up the airport announced they were closing runway 15-33 for special op's. Yikes! I was number two behind a husky and he asked to get out prior to the close. I also called to request departure since I was waiting to launch number two. I got the go-ahead to get on out so we did. 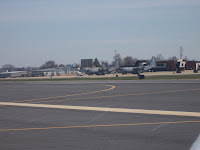 I announced airborne and thanked op's for letting me out on runway 33. I got the ole' double mic click as acknowledgement from op's as they sat at the approach of 15 and I rocked the wings as i passed over then continued my climb out. The ride home was bumpy too, trying to maintain 3000' and our heading was fun. 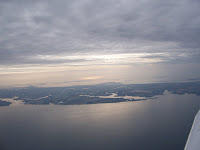 I didn't want to climb over the top of the clouds and then ride through it, the bumps, for my decent into Wilmington. 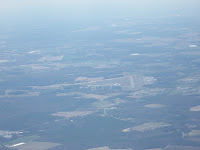 I monitored Dover approach on the way home flipping over to the Wilmington tower after noting the current ATIS. "Wilmington tower, Archer 28679er 15 south, inbound for full stop, with X-ray." 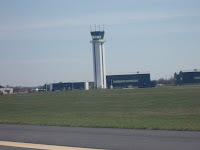 The tower acknowledged and requested I report left base for runway 32. At five miles, before I even got to report I was was cleared to land. I acknowledged, "cleared to land 32 for 679er." 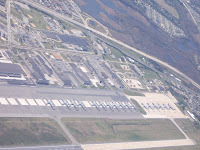 What is the magical distance from the airport to call out your base entry? I had decided on a three mile call but as I stated got the clear to land ahead of time. I hoped for some crosswind practice since I turned down the option for runway 27. Just at pattern altitude (1080') as I make the 3 mile mark I throttle back and settle in adding a second notch of flaps as I turn final. With the wind update, now 28016G20 I need to keep my speed up to 70kts and make for the center line. I cross the fence and add the last notch of flaps holding it off, getting that sight picture, 65kts, 60kts, mains down no chirps to speak of followed by the nose wheel. Ahhh...bout time I hit one at home! The moment of pleasure is short lived as the tower tells me to taxi at best speed then turn right on 27 followed by left turn at K5. I reply with "expedite taxi turn right 27 left Kilo 5 for 679er" Flaps retracted, slight back on the yoke we hurry along. Mary calls out clear right as we approach the intersection of 32 at 9-27, I call clear left and I follow the tower's directions. With 679er secure we order fuel and complete the lock up procedures. We have it down to about 15 minutes from shut down to truck. Today we got a bit sidelined when we met one of our ramp neighbors. A really nice couple late 60's early 70's with a beautiful Cherokee 140. They took a ride to the airport but decided it was to windy for their liking. We paired off, the men talking flying of course and the ladies going full speed about who knows what. Really nice folks and we were very glad to meet them. Mary needed something to drink and I did too. Mary handled the driving duties on the way to wawa and to the house. Home sweet home, the animals are happy to see us. Maggie acts like we have been away for weeks and the cats...well their cats, you know. Next up is the Wings Fly-B-Q at KLOM unless we get a real nice day between now and then. 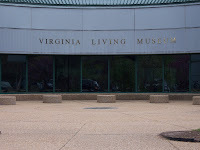 We might slip out on a weekday to complete another of our day trip locations to Luray Caverns in Virginia. While most pilots were out enjoying this day flying, the aviation community was saddened by the loss LCDR Kevin "KojacK" Davis of the Blue Angels who lost his life performing during an air show. We should all take a moment to remeber him in our prayers and thank all our men and women in service around the world who provide the freedoms we enjoy everyday. It was an early start with 8:30 batting practice followed by our 9:30 game that Mascelli Financial did win, in the ugliest of ways. Defense was like the first time playing together and base running was....well lets skip the rest of the story and get to the flying portion of this day. 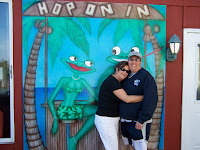 Mary and I asked John and Kim if they wanted to join us in Ocean City, Md. Remember, Kim only has one flight under her belt and it was a 20 minute hop each way. 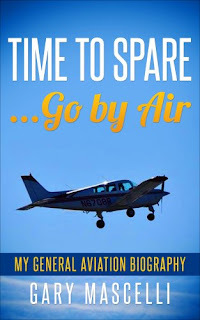 Today I flight planned for KILG to KOXB, forty five minutes ETE heading to the boardwalk and a return of fifty minutes or so. Both flights ended up about fifty minutes takeoff to landing. We were uncovered, pre-flighted and ready to go by 1pm. A quick good afternoon to Wilmington ground with current information had us on our way to runway 27 at intersection 'M'ike. Run up complete we are cleared to go 27 with the tower calling out a banner tow aircraft at our 2 o' clock. I acknowledge cleared for take off and the traffic. Climb out was bumpy as I reported our turn on course with the tower quickly acknowledging. Clear of the class 'D'elta I tuned to Dover approach 132.42 and advised of our position and intentions. We got our squawk code, dialed it in and were on our way with some extra eyes. The ride was much smoother as we now cruised along at 5,500 feet. 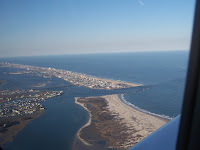 Our flight plan was to head to the ATR VOR (Lewes,DE)then due south to KOXB. 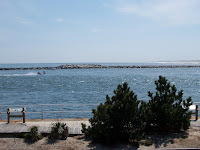 It was a nice view along the Delaware Bay. Easily viewed to our 9 o' clock across the Bay was KMIV and KWWD and at our 3 o' clock Georgetown, KGED (pictured left). 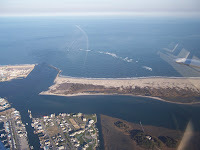 About fifteen miles north of Ocean City I canceled flight following and tuned the AWOS and CTAF frequency to advise Ocean City traffic that we were ten north inbound for full stop. The ladies were yucking it up while checking out all the homes as I made my way to position and enter left base for runway 14. 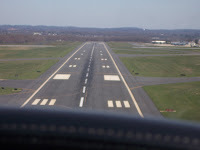 John and I spotted the Cessna Cardinal turning base and final and I decided to follow him on in to runway 14. Each of us calling our position, I add the last notch of flaps early as I turn final and slow enough to let the cardinal clear the runway. Short final now just over 60 kts and on center I set 679er down soft and smooth.....it felt great after my last landing back home at KILG. Fuel ordered, (fill to tabs) we jump in the Ace Taxi van and head for the beach. Twelve dollars later we are walking the boards! Kim noted Fischer Popcorn (white cheddar) that had to go home with us, and it eventually did. We headed south walking the boards looking at the rides, shops and for a place to have lunch. We decided on Frog's. 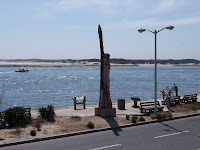 A small place over looking the channel at the very end of Ocean City. Mary had a burger, onion rings and a few brews. 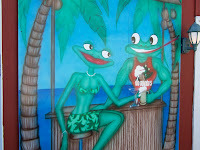 I had a Froggy salad that had chicken fingers and honey mustard dressing with an Ice tea. Kim had the same salad with ranch and a cold one or two and John had chilli with onions and cheese. The food was good as well as the service. The place is really really small, so if lack of space wigs you out, you might think twice. 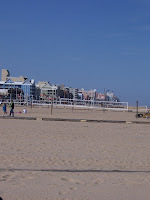 Once our tummy's were full we strolled back north up the boardwalk and purchased tickets for a round trip on the tram car. Tickets were three bucks each person each way. The Tram car moved at it's own pace. The old timers running the show were not in any hurry but were very friendly. After making the complete loop on the boardwalk we were finally heading back (to stop at Fischers) and with a simple raising of your hand signaled for the tram to stop. Popcorn accounted for, we called Ace Taxi and met at Tony's pizza. Ten minutes later I was pre-flighting for the ride home. Potty breaks complete the ladies climbed in. The FBO closed at 5 but I had paid for fuel in advance so my receipt was tucked under the nose wheel chock. The girls ended up having to use the facilities at the jump school. AWOS noted we taxied out to runway 20 and launched for home. Cross wind and down wind provided some great photo op's. 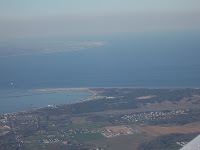 Up the Delaware coast we steer a course for the Salem cooling tower now visible at about 45-50 miles. The haze was a bit thicker and the sun glare a bit stronger. Dover approach was really good today as we headed home. No calls for traffic for us but a few others were advised to be on the look out. About 20 miles out I canceled flight following with Dover and tuned the ATIS for Wilmington. Information 'J'uliet in hand I call in and advise of my position with landing intentions and after a quick re-key advise with info 'J'uliet. I was asked what direction I was coming from and advised from the south once again, which would require a left base for 32. I was given a right base entry for 32 instead. Strange, and as the PIC have every right to question that last directive. Once the radio was quiet I asked to confirm my 3 mile right base for 679er. With out missing a beat I was instructed to enter 3 mile left base. Ahhhh...now that's more like it. I called my 3 mile left base and was cleared to land 32. My landing was dead on the glide slope with the PAPI's red over white. 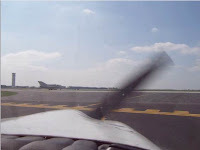 Slowing down on center I touch with minimum stall horn, somewhat flat again followed by a short skip with nose wheel soon to follow and to make it worse with a bit to much back pressure that had me wheelie and then touch the nose down again. Both landings at home the last two flights were not my best but I will get some seat time and hear that stall horn wail! We all pitched in and secured 679er and slowly dragged our butts to the vehicles. I wasn't really tired but the sun beating in the whole way home made the eyes and face feel like they were cooking. Mary drove us home and suggested a quick pit stop. I was happy to make that stop at the Charcoal Pit for a Pineapple Sunday and for her a root beer float. A quick write up, although long winded as usual, has me ready to call it a night. 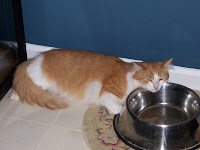 Obviously George had a long day too, he decided to camp out at Maggies dish until someone, anyone gave him some fresh water, what a hard life. Thanks John and Kim for a fun afternoon sharing our trip to Ocean City and walking the boards! A change in plans after watching the extended weather has us adding a day on the front end of our mini vacation. 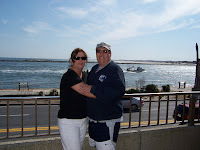 With storms forcasted for Thursday Mary and I decided to depart Wilmington on Wednesday. It's brisk this morning as we arrive to pre-flight 679er but it is crystal clear. Bags packed, buckled in, ATIS noted and I call good morning to Wilmington ground, Archer 28679er at Red Eagle with Hotel, ready to taxi for VFR departure to the south. Wilmington responds with taxi to 27 via Kilo, Mike hold short for departing traffic. Run up complete I switch to the tower and advise Archer 28679er ready to go at Mike runway 27....cleared for take off we roll out and ....we are off on our vacation! Nice and smooth today as we make our way south for the SBY VOR. Dover Approach eventually provides flight following since Philly approach would not answer my calls. I don't know why I waste my time calling them. Dover sounds sharp and the pace seems pretty laid back with not much activity this morning. 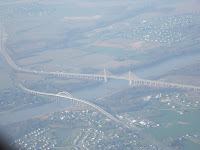 Mary adds some nice photos to our flight journal with pictures of the new SR 1 (background)and St. Georges Bridges over the C&D canal and a barge hard at work moving through the the C&D. Dover hands us off to patuxent approach who rides along with us until almost Cape Charles, CCV VOR. We get handed off to Norfolk who immediately tells us to stay clear of the class C airspace. Well no kidding....We didn't even cross over the Cape Charles VOR, heck we didn't even make feet wet at this point. I get a return call from approach and he confirms destination as we "ride along" together over the Bay. 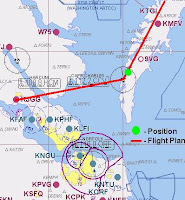 Once over Point Comfort we get handed off again to another Norfolk Approach covering the area north and west of Newport news. I am cleared to descend at my discretion to not below 2,500 and to acknowledge field in site. I confirm instructions and eventually announce field in site and comply with maintain VFR squawk 1200. 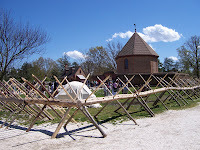 Williamsburg Jamestown here we come! Airport advisory has winds at 115*-120* at 8 kts just nice for a landing on r/w 13. 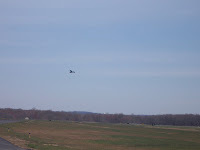 I announce cross wind entry for 13 and lose the last bit of altitude and join the pattern at 850'. Midfield downwind followed by right base and really short final has us on the ground and looking for our turn off to taxi. With 679er secure, covered and unpacked we gather up our bags and head into the terminal. Our rental is waiting, (Chrysler PT Cruiser) and we load it up. 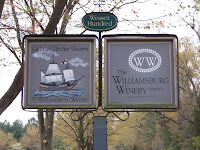 The restaurant is not open until 11am so we decide to head to the Williamsburg Winery for a tour and taste test. Mary likes wine and I...well I just tag along, listen to the info and ask questions about the process. 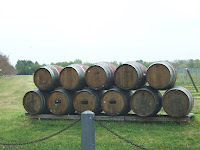 The whole relationship with the wooden barrels and costs per barrel and life span of each barrel peaks the engineer in me. We enjoy the tour and I even found a wine I didn't mind all that much. 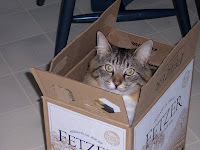 Of course we made a purchase of five or six bottles and had them boxed for the flight home. 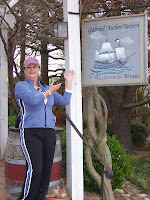 We crossed the compound and decided to try the Gabriel Archer Tavern for some early lunch. We each ordered a roast beef with brie, I had sweet tea and Mary a glass of white wine. The service was excellent and the food just as good. It was now starting to rain, just a very light showers and it would stop as fast as it started. We loaded the latest booty into the PT Cruiser and headed east on Rt. 64 for Victory Blvd., in Newport News for the Hampton Inn. The check in was for one night only and then we would have to move to the regularly scheduled room. Reminder, we added Wednesday as a last minute deal due to weather. Needless to say the place was booked solid with some basketball tournament in town. 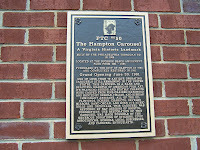 Check in complete with the Hampton we decide to round out the afternoon with a trip to the Virginia Living Museum. What a place! 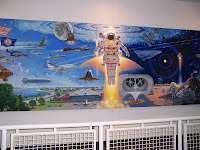 In 1987, the museum became the first living museum east of the Mississippi, combining the elements of a native wildlife park, science museum, aquarium, botanical preserve and planetarium. 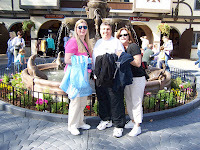 Some of the many attractions we had the pleasure of viewing are captured in the photos we have posted. Mary and I both fell in love with the Bald Eagles. 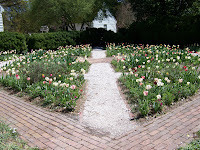 I can not begin to describe the many native plants and tree's that are noted as you walk the grounds. 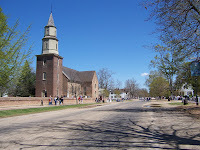 Inside there are areas that describe all about Jamestown. 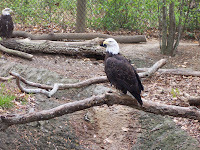 You will also walk through a Cedar swamp display and have a chance to see the native birds in the State of Virginia. 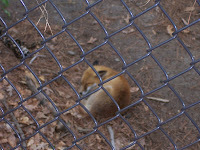 Mary just loved the newest addition pictured on the right, yes this little red fox would have come home with us if it was permissible. Mary and I decided it was time to head back to the room and get cleaned up for dinner. I really could use a nap but we decide to head out and try our luck at a big juicy steak at the Texas Roadhouse. We finally catch up to Susan who has been trying to flip her "sleep" shift for our arrival. Susan is a Emergency Room RN at the Williamsburg Hospital, so she keeps pretty dang busy. It was so nice to once again share some time with one of Mary's best friends. We talked for what seemed like hours, enjoyed great steaks and due to weight and balance concerns we passed on the dessert. We call it a night, now passing 11pm and decide to meet up around 5:30pm Thursday evening for Italian dinner and the Manheim Stemroller concert at the Ferguson Center. Mary and I didn't really sleep in all that late this vacation morning even though we had no pets to take care of. 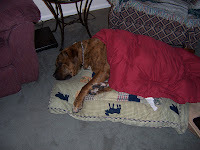 Speaking of pets here is a recap of our departure from home. I'm not really sure but I manage to talk Mary into a breakfast at the Waffle House. Hey don't knock it, I love those places. There is nothing better then an order of scattered smothered and covered....you figure it out. While enjoying our breakfast at the finest of places (insert smirk) it decided to down pour. Ahhh, no worry we're on vacation. 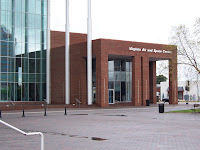 We finish up and review directions to the Air and Space Center in Hampton, Virginia located just less then 30 minutes from our hotel and about 15 from the WH. We arrived early but still had to contend with all the school field trips. There had to be hundreds of 2nd graders! We made the rounds checking out the various aircraft and displays. 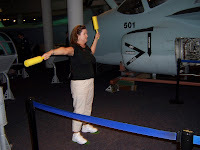 Mary decided to play "shooter" on a carrier deck and took hold of the signal sticks and gave it a go. She can launch me off the deck anytime! I had a chance to check out the Amateur radio station set up and view some very old code keys and equipment. One of my all time favorite aircraft is the F4 Phantom. I mean this baby looks bad to the bone and in my opinion is what a fighter should look like. 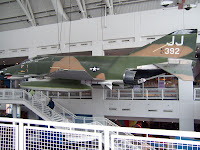 The F4 Traveled faster than Mach-2 at 40,000 feet and the aircraft at the center has two confirmed MIG kills from the Vietnam War. 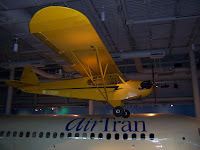 Some of the other aircraft displayed are listed here on the Air and Space Center web pages. I will post a few of the shots Mary and I saved while walking around. We didn't get a chance to try our hand at the full motion sim, the operator for that attraction did not show up on time. We decided to stroll around town and take a few pictures. One neat attraction was the merry go round or the carousel as some call it. Mary got a few pics and the plaque explaining it's existence. A nice parting shot of the water front as we made our way to the roof of the parking garage (which was free)looking for the cross over exit ramps. Hmm, odd, there was none, we had to turn around and head back down which made for some interesting looks as you pass people around the turns. After our tour of Hampton we once again made our way to Rt. 64 and proceeded west to Colonial Williamsburg. We made a quick stop to check on 679er since she went through some high winds Wednesday night. There was a tornado watch until 11am this morning. Our girl was safe and still tied down, anxious to get back in the air until I re-assured her we would be back Saturday morning bright and early. Mary and I finally had lunch at Charlys! The food was fantastic, service just as good and we had a nice sit down chat with Jean Waltrip, one of the owners. This lady is a class act, Mr. and Mrs Waltrip were inducted into the Virginia Aviation Hall of Fame November 17, 2001. Larry and Jean are the first husband and wife team ever to be elected to the Virginia Aviation Hall of Fame. 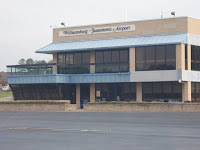 They have owned and operated the Williamsburg-Jamestown Airport since they founded it in 1970. They have also been recipients (in 2005) of the Captain John Smith Award. The award, given by James City County’s economic development division, is the county’s most prestigious award and is presented at Jamestown. These folks continue to promote GA at every turn. My hats of to you Jean & Larry! Our lunch complete we once again climb in the PT Cruiser for a short hop to Williamsburg. 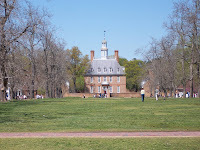 Colonial Williamsburg was fairly busy this day. We made our way down one side of the street and back up the other, taking moments to snoop in the shops and take in the fresh air. 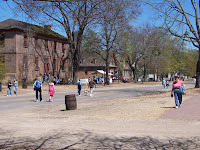 I think today's stroll along the streets of Williamsburg is my tune up for Busch gardens tomorrow! We ran short on time since we needed to meet Susan and the group for dinner at 4:30 prior to heading over to the Concert at the Ferguson Center. Once again pointed east on RT 64 we were underway for a non-stop to the Hampton Inn. I spoke to soon since we got caught up in traffic six miles before our exit. Arrggghh....a waste of 45 minutes as we funnel down to one lane and pass the accident mess. Just enough time to shower change and head downstairs....I'm needing a nap! Off we go again and Susan is doing the driving. I needed a break as we chatted and enjoyed the ride. 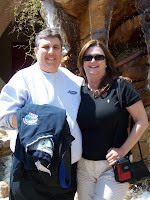 We caught up with everyone at Luigis Italian restaurant located on Warwick Blvd in Newport News. The food once again was very good and the service just as great. We managed to pack in some home made cannoli's for dessert and I almost had to be carried to the car. I was full, fat and happy with left overs to take back to the room. We arrive at the Ferguson Center and quickly find our seats in one of the boxes. Great seats! The show starts in no time at all and we are treated to a fantastic concert by Mannheim Steamroller presenting their Fresh Aire festival. 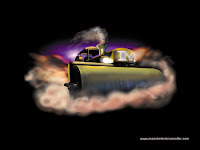 The Music of Mannheim Steamroller is a concert tour created, arranged and produced by Chip Davis. In Fresh Aire, Davis created groundbreaking music that is an innovative blend of classical themes with pop elements that he calls, “18th Century Rock-n-Roll.” Mary and I really like their Christmas music but this was a nice change of pace. The concert lasted about two and a half hours with the finish presenting a taste of the Christmas favorites. Job well done ! We say our goodbyes to the group as we pile in Susans town car. The ride is soft and smooth, I could fall asleep in my seat, but decide I'm the co-pilot and should remain alert. Friday the 13th! Yes, friday the 13th and it shows it's ugly head early. We receive a call from Susan to tell us she will be running a bit late for our departure to Busch gardens, she locked herself out of the house. Apparently women change handbags, I don't know why and at the age of 49 know better then to ask. Us men never change wallets unless they fall apart, what's wrong with that ? Anyway, we get underway and make good time to the park. Traffic is backed up but seems to be moving along and all the drivers seem to be playing nicely with each other. We start our adventure at 10:30 am and the ladies walk my legs off until 7pm. We enjoyed a couple of shows along the way, I vote the Irish dancers were the best. We listened to some Irish band then went in the building pictured on the top left. 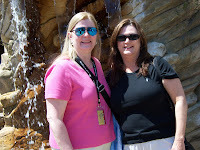 We took some pictures along the way, here at he pot of gold Irish fountains. Finally the rose between two thorns.....just kidding. We made a stop in Germany and had to take a picture at the fountains. The ladies fed me very well at the Smokehouse; brisket,ribs,chicken and carrot cake. We did manage a ride or two along the way. I will say the park was very clean and the staff was very nice to deal with. After a long day at the park we high-tailed it back to our room where I checked on the weather for my flight plan and checked into the POA flash chat. Mary passed out quickly and I didn't last long myself. After a check on the weather last night and a look see this morning I decided to keep with the plan of a 7:30ish departure. We meet Susan at Cracker Barrel at 6:15am and enjoy breakfast without long lines or a crowd. You may think we're crazy but I didn't want any part of that front moving up from Texas to tap dance around for the ride home. We finished eating and made our way outside. It's always hard for Mary to say goodbye to her friend Susan. 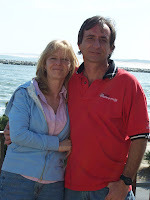 They have known each other for 33 years, shared a home and worked together. I have to say just flying to spend time with Susan and to see Mary's face light up when we get there was worth getting my PPL. 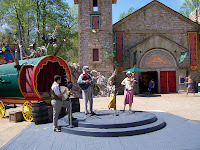 We will return soon to catch some shows at Busch gardens since we purchased a season pass for each of us. Maybe in June depending who is playing. We arrive at KJGG needing to return the rental and then preflight. I take care of the rental return and Mary uncovers 679er. Together we pack the bags, a case of various wines and aircraft essentials. Pre-Flight complete, door secured, a call for clear prop and 679er comes alive. Winds variable so runway 13 will be the calm winds choice. We taxi out listening to a Cardinal inbound for a full stop just entering the 45* for runway 13. I complete my run up and get ready to depart checking for traffic. I have the cardinal on downwind almost ready to turn right base. I announce departing 13 and roll out turning to the centerline and moving to full throttle. The Cardinal announces on final and unicom comes to life as the gentleman at the desk thanks us for stopping in and staying with them for the few days. I listen for the Cessna then acknowledge with a thanks for the hospitality and we'll be back soon. 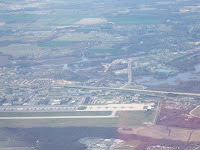 Climbing out to TPA and minding my course of 180* for noise abatement I flip to Norfolk approach. 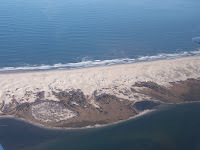 I quickly pick up flight following and make way towards Cape Charles. Mary takes some nice shots of the fleet as we head out over the Bay. Norfolk advises the Restricted area is cold and offers a direct route. I thank him but advise we want the scenic tour CCV SBY direct to Wilmington. He acknowledges and gives me vectors to help shortcut my route and help him with his traffic. 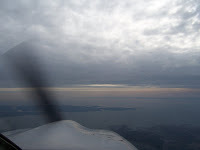 Smooth as silk this morning, climbing to 5500' and on a new heading of 70* crossing the Bay to then turn north 50* as vectored followed by getting cut loose at my descretion for SBY. The reflecting sun and clouds were really pretty today. Mary thought it was a bit hazy so she cat napped most of the way home. 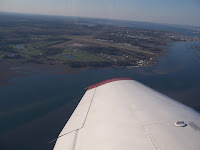 I was busy tuning my VOR route, looking for traffic and noting Tangiers, Acckomack, Ocean City, MD (in the distance), Salisbury and Georgetown. I was handed off to Dover and got a great look at the BIG BOYS (C-5's) on the ramp and a special bonus of one taking off to join in the fun. North of Dover I called out the traffic as alerted, it was getting busy. 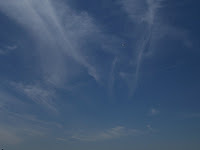 I had a jet on my six heading direct DuPont cleared by DOV for 3000' the same as I was just cleared and same direct to. I contacted KDOV to restate my five point five for three point zero and it was acknowledged. I didn't feel any safer. In a few minutes I was cut loose to squawk VFR and given the numbers for Philly approach. 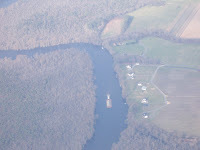 I was 17 south of Wilmington so I copied the KILG ATIS and made my call. I was told to report a 5 mile final for runway 1, seemed pretty easy with winds 280 5 kts. 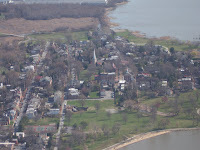 Mary was clicking off pictures of historic New Castle and a few shots of a Great Blue Heron acting as my wing man. 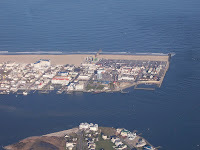 As I am ready to call my 5 mile final I am directed to turn and follow the New Jersey shoreline and the tower will call my turn to right base. The tower landed a grumman then had a jet no. 2 with me no. 3 and another aircraft instructed to follow the Piper (me)no. 4 to land. Cool, pretty busy airspace today that takes some thinking and some looking around. As I watch the jet on final I get the call to turn for right base, which is a left turn from my position. You got it, right wing high for a steep left turn (I was almost parallel to the approach)and I lost sight of the jets touchdown point. Right base followed by a very short final has me adding the last notch of flaps now pushing heavy to the right of center and my airspeed going to hell. I add power with 5500 feet of runway in front of me and set 679er down. Still pushing right and slow to respond ending in a short burst of the stall horn, a drop in to the runway with a heavy chirp, short bounce/skip and then mains down again. It sucked! 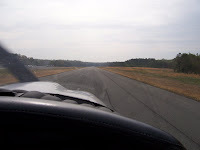 For the very first time I could smell some tire smoke and was landing on the right side of the centerline. Is this what wind shear or wake turbulence feels like ? Mary said the bounce wasn't that bad, I thought otherwise. The stall horn gave me a slight moan as I did set down but not as much as I like to hear. Tower has me stay on with him as I acknowledge my taxi to "K"ilo noting if I can count that as two. I know the guys in the tower and he says with a laugh, it sure would be nice if I could...at least Mary got a good chuckle out of that. 679er secured we finally head home. I have a little league baseball game in less then an hour and Mary heads out to pick up Maggie. Overall a GREAT trip! I'm tired, thirsty and tired of typing!